South Beds Dial-a-Ride aims to help people who cannot use a public bus service through reasons of disability, age or social exclusion. The service is a personal, reliable and friendly service to help maintain freedom and independence for those with a mobility issue. Serving the Central Bedfordshire towns of Dunstable, Houghton Regis, Leighton Buzzard and Linslade, and the villages of Aley Green, Aspley Guise, Barton-le-Clay, Battlesden, Billington, Caddington, Chalton, Eaton Bray, Eggington, Heath and Reach, Hockliffe, Husborne Crawley, Kensworth, Milton Bryan, Pepperstock, Potsgrove, Ridgmont, Slip End, Stanbridge, Streatley, Studham, Sundon, Tebworth, Tilsworth, Toddington, Totternhoe, Whipsnade, Wingfield, and Woburn. Now also available from Buckinghamshire villages for journeys into Central Bedfordshire and Luton – Bragenham, Burcott, Dagnall, Edelsborough, Great Brickhill, Ledburn, Little Brickhill, Slapton, Soulbury, Stoke Hammond, Wing, and Woburn Sands. Also from Hertfordshire villages for journeys into Central Bedfordshire and Luton - Great Gaddesden, Hudnall, Jockey End, Little Gaddesden, and Markyate. 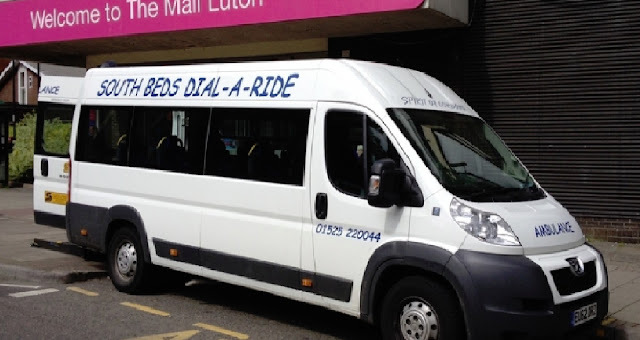 The Luton Dial-a-Ride service for individuals as well as working in partnership with many elderly and disabled groups in Luton. We are generously supported by Central Bedfordshire Council, Houghton Regis Town Council and from other donations. Dial-A-Ride is a door to door service with assistance where appropriate for those who find it difficult to use public transport. The other services we offer are aimed at providing support to the dial-a-ride service. ALL passengers MUST be members of South Beds Dial-a-Ride to use the service. This is a requirement of the permits from the Department of Transport. £10 per year. Central Beds members must possess a valid National Concessionary Bus Pass. Central Bedfordshire based members receive a fare subsidy from Central Bedfordshire Council. The level of subsidy varies throughout the county. Please see relevant “Membership Costs & Benefits Summary” for your local area. Luton based members pay a single fare of £4, £5 or £6 (maximum) depending on distance. We receive no subsidy from Luton BC for Luton’s members. Members call by telephone to make a request for a ride. Please see relevant “Membership Costs & Benefits Summary” for your local area for how to get the most out of your membership. An essential companion may travel with the member free of charge. Others at cost.